I am obsessed with Time; not only I have a weakness for wrist watches, I have several clocks around my house. Only when I am traveling (especially in france where Time is an elastic commodity) the passage of time becomes kind of blurred but I’ve never had any desire to go back nor forth in Time; the whole notion of a Time Machine has never appealed to me (not even to my trekkie side). Entropy rules supreme! 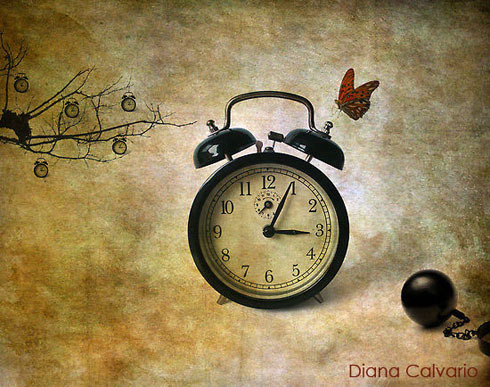 I love this piece by Diana Calvario, my new friend at redbubble. 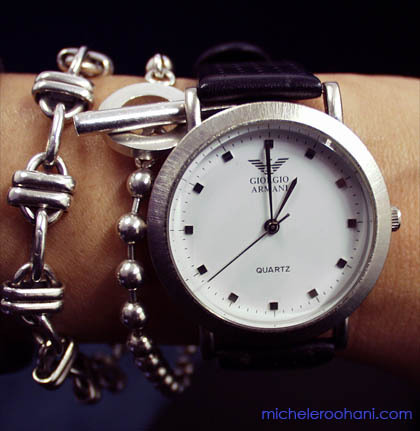 This entry was posted in art, culture, images, love, photography, poetry, science, technology, thoughts and tagged aragon, einstein, poetry, time by Michele. Bookmark the permalink. Brilliant Photography & Awe inspiring content..
What is this thing, time? Let Augustine be our spokesman. the lover the dragging of its chained feet. that is the Sun in Australia. and arriving there are insolvent. Young, our hobby was assassinating it. Old we pray for its recuperation. Time is the great equalizer. It knows no race, socioeconomic class, power, rank, wit, or gender. The one thing we all have the same amount of in a given day. Our differences, often, are how we extract the essence of life from these very same fleeting moments. Y A-T-IL UN TEMPS FEMININ? Y A-T-IL UNE POESIE FEMININE? SANS REMONTER LE COURS DE CE QUE LUCE IRIGARAY APPELLE “LE MYSTERE OUBLIE DES GENEALOGIES FEMININES” JE PARLERAI DE FOROUGH FARROKHZAD, DONT LA VIE TEMOIGNE D’UNE LIBERTE QUI NE CESSE D’INSPIRER DES GENERATIONS DE FEMMES. PEU D’OEUVRES, A PART CELLE DE SAPPHO, ONT SU NOUS TRANSMETTRE UN REGARD DE FEMME SUR LE MONDE FEMININ. REVOLUTIONNAIRE EN POLITIQUE, FOROUGH FARROKHZAD NE L’EST PAS MOINS EN LITTERATURE, OU ELLE SE PROCLAME L’ADEPTE DE NIMA YUSHIJ ET DENONCE LES IDOLES QUI SERVENT D’ALIBI, A SES YEUX, A L’EMBOURGEOISEMENT DES AMES ET A L’ASSERVISSEMENT DE L’ART. CERTES, LA NOUVEAUTE DE FOROUGH PAR RAPPORT A CE QUE L’ON APPELLE, DE MANIERE TOUJOURS UN PEU VAGUE, LA TRADITION EST UN FAIT ACQUIS, MAIS IL NE FAUT PAS OUBLIER QUE L’APPORT DE CE TON ET DE CE REGARD NOUVEAUX, LOIN DE SIGNIFIER LA RUPTURE AVEC UNE TRADITION DEPASSEE, VISAIT A REVIVIFIER UN STYLE PERDU, UNE ECRITURE QUI PREFERAIT L’ECONOMIE DES MOYENS ET LA CONCISION FULGURANTE A LA RHETORIQUE VERBEUSE ET AU PATHOS DE BONS SENTIMENTS. FOROUGH MET EN OEUVRE SON ETONNANT GENIE DE SYNTHESE NON POUR PATAUGER DANS LES EAUX TIEDES DU JUSTE MILIEU, MAIS POUR AIGUISER SES PROPRES CONTRADICTIONS. FOROUGH RESTE VIVANTE, NON PARCE QUE SES POEMES SONT DE MORCEAUX DE CHOIX ET DE PROIE POUR LES AUTEURS D’ANTHOLOGIE ET DE MANUELS UNIVERSITAIRES, MAIS PARCE QUE, CONTRAIREMENT A LA PLUPART DE SES CONTEMPORAINS, ELLE N’A PAS TRICHE, ELLE N’A PAS MANQUE SES DECHIREMENTS, SES DOUTES, SES PETITESSES, SES RANCOEURS SOUS LES ORIPEAUX DE LA BELLE LITTERATURE. SI LES ECRITS QU’ELLE A LAISSES NOUS TOUCHENT ENCORE, TOUS SES ECRITS ET PAS SEULEMENT SES POEMES, MAIS JUSQU’AU MOINDRE FRAGMENT, JUSQU’AUX PAGES RATUREES DE SES BROUILLONS, C’EST PARCE QU’ILS DEMEURENT UN BRULANT FOYER DE TENSIONS. DANS L’ETUDE D’UN AUTEUR LA CONNAISSANCE DE LA VIE NE REMPLACERA JAMAIS CELLE DE L’OEUVRE: QUE L’OEUVRE EXISTE EN SOI ET POUR SOI, CELA NE SIGNIFIE PAS QUE L’ON DOIVE SE PRIVER D’UN INSTRUMENT PRECIEUX DE COMPREHENSION DU PROCESSUS MEME DE LA CREATION. LA PORTEE D’UNE OEUVRE EST LIEE A SES ENJEUX, NON SEULEMENT AUX DETERMINATIONS QUI ONT PESE SUR SON ELABORATION, MAIS A LA PLACE DE L’OEUVRE DANS LA VIE, DE LA VIE DANS LE SIECLE, A L’APPORT DE L’OEUVRE AU FLUX MOUVANT ET CHANGEANT DES IDEES ET DES FORMES, A LA FONCTION DE L’ECRIVAIN DANS LA SOCIETE. DANS LE CAS DE FOROUGH FARROKHZAD, LES ENJEUX SONT D’AUTANT PLUS CRUCIAUX QU’ILS PORTENT SUR LA CONCEPTION MEME DU LANGAGE POETIQUE QUI, APRES ELLE, VA BASCULER VERS D’AUTRES HORIZONS. C’EST POURQUOI, AVANT D’ABORDER L’ANALYSE DES TEXTES EN TANT QUE TELS, IL IMPORTE DE LES SITUER DANS LEUR CADRE BIOGRAPHIQUE ET HISTORIQUE. LE REMARIAGE DE SON PERE, LE COLONEL MOHAMMAD BAQER FARROKHZAD, ALORS QUE LA FUTURE POETESSE N’A QUE SEIZE ANS, VA MARQUER PROFONDEMENT SA SENSIBILITE. IL SERAIT SIMPLISTE D’EXPLIQUER SA VOCATION DE POETE PAR CETTE BLESSURE, MAIS COMMENT NIER L’INCIDENCE D’UNE SITUATION RESSENTIE PAR ELLE COMME UN ABANDON SUR SON OEUVRE, SUR SA VISION DU MONDE. NUL DOUTE QUE LINCURABLE NOSTALGIE DU PARADIS PERDU QUI RETENTIT DANS SES PLUS BEAUX VERS PROVIENT DE CETTE FAILLE. ON NE PEUT DISSOCIER SA CREATION POETIQUE DE CE DECHIREMENT EXISTENTIEL AUQUEL ELLE DEVRA SON IDENTITE, SON FREMISSEMENT ET AUSSI SA FRAGILITE, SA RELATIVITE. LE TRAVAIL SOUTERRAIN QUI A SUIVI CETTE BRUSQUE REVELATION DE SA SOLITUDE ET DE SA SINGULARITE, BIEN QU’IL N’EXPLIQUE EN RIEN SON EVEIL A LA POESIE, ET ENCORE MOINS SON GENIE POETIQUE, ENTRERA CERTAINEMENT POUR BEAUCOUP DANS SA VOLONTE D’ETRE POETE. PAR LA-MEME, LES TRACES INDELEBILES QUE LAISSERA DANS SON AME CETTE EXPERIENCE PRECOCE D’UN DELAISSEMENT EPROUVE COMME UNE VERITABLE DERELICTION, FORGERONT LA FONDAMENTALE AMIBIGUITE DE SON ATTITUDE ENVERS LA VIE, ENVERS LE MONDE ET SURTOUT ENVERS LE LANGAGE. ON PEUT MEME IDENTIFIER L’EVEIL EN ELLE DE LA VOCATION POETIQUE A CE PASSAGE DU DELAISSEMENT A LA DERELICTION, MOT CHARGE DE CONNOTATIONS CORANIQUES, QUI DESIGNE L’ETAT D’ABANDON DE L’HOMME PAR DIEU. LE SENTIMENT DE DERELICTION EST CELUI-LA EPROUVE PAR LE CHRIST AU JARDIN DES OIVIERS, QUAND IL REPROCHA A SON PERE DE L’AVOIR ABANDONNE. LA DERELICTION, C’EST LE DESESPOIR DE L’AME LAISSEE A ELLE-MEME, DE L’AME QUI SE SENT EXCLUE DE LA GRACE DIVINE. L’USAGE POETIQUE DE LA PAROLE EST SCELLE PAR CET AGRANDISSEMENT DE LA DESTINEE INDIVIDUELLE EN DRAME UNIVERSEL, COSMIQUE, LE DRAME DE L’HUMANITE DECHUE. ON PEUT DONC PARLER DE PRISE DE PAROLE DU POETE, COMME ON PARLE DE PRISE D’UN SACREMENT. IL AURAIT ETE DIFFICILE D’ETRE PLUS LUCIDE ENVERS L’EGALITARISME TERRIFIANT QUI, SOUS SES YEUX, ENTRAINAIT LE NIVELAGE DE TOUTES LES VALEURS ESTHETIQUES ET CULTURELLES SOUS LE PIED D’UN UTILITARISME NAUSEEUX. FOROUGH A ETE LA PREMIERE A DECHIFFRER DANS LA SOCIETE DE SON TEMPS DES TARES APPELEES A PROLIFER ET A PROSPERER, DE VERITABLES MALADIES DE L’AME QUI RISQUENT A TERME D’ENTRAINER LA MORT DE L’HOMME COMME ETRE PENSANT. LES POETES ONT UN SIXIEME SENS QUI LEUR ECLAIRE L’AVENIR. LA POESIE POSSEDE CLAIREMENT LE SENS D’UNE RESISTANCE. DANS LE CAS DE PAYS EN GUERRE OU OCCUPES OU SOUMIS A LA CENSURE LA POESIE PEUT PRENDRE LA TEINTE D’UN COMBAT IDEOLOGIQUE. LE SENS SUBVERSIF DES MOTS ASSEMBLES DANS LE POEME SE DOUBLE SOUVENT D’UN RENOUVELLEMENT DES FORMES PLUS OU MOINS RADICAL: C’EST UN AUTRE COMBAT, CETTE FOIS-CI INTERNE AU POEME, ET UN TRAVAIL FONDATEUR DE DESTRUCTION-RECONSTRUCTION. FOROUGH A TOUJOURS ATTACHE UNE IMPORTANCE CAPITALE A LA COMPOSITION DE SON OEUVRE, A L’ARCHITECTURE DE SON LIVRE. SANS DOUTE, CETTE PREOCCUPATION A-T-ELLE L’UNE DES CAUSES DE L’EXTREME LENTEUR AVEC LAQUELLE ELLE A PREPARE L’ELABORATION ET LA PUBLICATION DE SES RECUEILS DE POEMES. EN FAIT, IL NE S’AGISSAIT PAS SEULEMENT POUR ELLE DE REUNIR DANS UN SEUL VOLUME DES POEMES EPARS, MAIS DE LES INTEGRER DANS UNE FORME DOUEE D’UNE FORTE COHESION, D’UNE NECESSITE ORGANIQUE. IL VA DE SOI QUE LE TITRE QUI VA FINALEMENT COURONNER CETTE SOMME ET LUI DONNER A JAMAIS UN SENS, CE TITRE EST VENU SIGNER UN PROJET QUI, LONGTEMPS AVANT DE SE DECLARER ET DE TENTER DE S’ACCOMPLIR, A ETE LE FIL CONDUCTEUR LATENT D’UNE INSPIRATION PARESSEUSEMENT ET SAVAMMENT ORIENTEE. LE CHARME VAGABOND DE LA POESIE EST DE SE PLIER A LA VIE, EN QUOI ELLE EST PROCHE DU JOURNAL INTIME. C’EST POURQUOI UNE OEUVRE POETIQUE DONNE TOUJOURS QUELQUE PRISE A L’ILLUSION RETROSPECTIVE. TOUTE LA QUESTION EST DE SAVOIR SI LA FORME QUI SATISFAIT ENFIN L’ESPRIT ET LE COEUR, L’OEIL ET L’OREILLE, EST UNE ILLUSION OU AU CONTRAIRE UNE CONSTRUCTION QUI NE REVELE SA CHARPENTE QU’AU TERME D’UN LONG ET CAPRICIEUX PARCOURS. PARLER D’INSPIRATION A PROPOS DE LA POESIE, C’EST RAPPELER QU’ELLE EST TISSEE D’UNE SUCCESSION DE MOMENTS DE HASARD OU, SI L’ON PREFERE, DE GRACE. ET POURTANT, CETTE SUCCESSION APPAREMMENT DECOUSUE, CAR TEL EST LE PRIX DE LA LIBERTE, DE L’IMPROVISATION, OBEIT DE MANIERE SECRETE A UNE EXIGENCE D’UNITE; ELLE EST MUE PAR UN DESSEIN. FOROUGH AVAIT TRES TOT PRESSENTI QUE LE MOT DE LIBERTE COUVRIRAIT UN JOUR LE CONTRAIRE DE CE QU’IL ETAIT CENSE SIGNIFIER POUR LES PARTISANS DE L’DEE DE PROGRES. ELLE SAVAIT QU’IL ETAIT VAIN DE LUTTER CONTRE UNE ABJECTION APPELEE UN JOUR A DEVENIR UNIVERSELLE. ELLE EN AVAIT DEDUIT QI’IL N’Y AVAIT DESORMAIS PAS D’AUTRE CHEMIN POUR LA POESIE QUE D’AFFRONTER CETTE ABJECTION POUR Y PUISER LES ELEMENTS D’UNE BEAUTE NOUVELLE. ELLE NOUS A LAISSE, PAR SON DIABOLIQUE COURAGE E PAR SON INCURABLE OPTIMISME, PAR SA FOI DANS L’ART, EN DEPIT DE TOUT, UN ADMIRABLE EXEMPLE DE RESISTANCE A UNE IGNOMINIE SOCIALE QUI NE DEVAIT CESSER DE GRANDIR ET QUI, AUJOURD’HUI, ETALE SOUS NOS YEUX SES TRISTES TURPITUDES. SA POESIE, C’EST, D’UNE PART, LA VIE FAITE OEUVRE, L’ETRE ET LE TEMPS HUMAINS TRANSMUES EN LANGAGE, MAIS C’EST EN MEME TEMPS LA CREATION POETIQUE SAISIE A JAMAIS DANS SA LANGUE DE CHAIR: C’EST CE PATIENT ASSEMBLAGE DE MOTS QUI FAIT UN POEME, CETTE CONSTELLATION SANS CESSE CHANGEANTE ET MOUVANTE DE POEMES QUI FAIT UN LIVRE, MOTS ET POEMES REVELES DANS LEUR FRAGILITE, EMPORTES DANS UN COURANT QUI EST CELUI DE L’EXISTENCE, AVEC TOUT CE QUE CELLE-CI COMPORTE DE RARE ET DE BANAL, D’UNIQUE ET DE COMMUN, DE FUGACE, DE HASARDEUX ET D’ETERNEL. CETTE OSMOSE QUI REND L’OEUVRE ET LA VIE AUSSI INDISSOCIABLES QUE DES VASES COMMUNICANTS, EXPLIQUE LE CHOIX PAR FOROUGH D’UN TERME AUSSI SURPRENANT AU PREMIER ABORD QUE CELUI DE “ASIR” (PRISONNIERE) POUR TITRE DU PREMIER DE SES PROJETS ABOUTIS: UN MOT PORTEUR SOUS LA PLUME D’UNE POETESSE AUSSI EPRISE DE PERFECTION ET AUSSI SOUCIEUSE D’AFFIRMER SES AMBITION QUE L’ETAIT FOROUGH. SES POESIES, QUI DESSINENT UNE COURBE DESCENDANTE, DECRIVENT UN VOYAGE INITIATIQUE. EN DEPIT DE LA DIVISION THEMATIQUE ET DE LA FRAGMENTATION EN POEMES DISTINCTS, IL EST AISE D’Y LIRE UNE HISTOIRE, UNE HISTOIRE INTERIEURE, L’HISTOIRE D’UNE AME. SI FOROUGH AVAIT EU LE TEMPS DE DEVELOPPER SES IDEES, ON IMAGINE QUEL ETRANGE SYSTEME DE LA MODE EN SERAIT SORTI! appealing. The classic is Baudelaire L’Horloge, the picture Dali with melting clocks, the Ur-picture the Strassbourg Clock. Time must have a stop (Shakespeare), to set it right you need the sexton from Hamlet. 1-Do not rule out the benefits of time travel so quickly.Possibilities are mind boggling. For one, just imagine that you can visit a wonderful period in your life over & over. Theoretically speaking, you can stay in a “Do-Loop”, never age and enjoy eternal happiness! 2-If possible, a once-in-a-while translation to English (for us illiterates) would be nice. Baudelaire’s poem, mentioned by Tamas Ungvari, brings us brutally back to reality of the human condition. A translation to English for Shandiz follows. Terrible Clock! God without mercy; mighty Power! Will make thy heart its target, and stick and vibrate there. Remember! and wash well the gravel in the pan! Makes a strong adversary. Is thy game begun? The gulf, — it still is thirsty. The sands are all but run. among the fingers of the light and the sleeping eyes. no one can stop the river of the dawn. your eyes and their sleepiness, my dearest. between the vertical light and the darkening sky. with its punctual, mysterious courtesy. to your daily voice, to your nocturnal skin…..
nadie detiene el rio de la aurora. I have never been so sure of NOT WANTING to be young again! I was chaperoning at one of my son’s events recently (he is 15) and was standing in the corner watching the young crowd having fun. I started thinking, would I want to be in their place? As the question swirled in my consciousness, I started watching them more intently, started noticing the nuances of the moment and their interactions. It was interesting to see that although they were young, vivacious and full of life, their body language was speaking more clearly than what they were saying in words. Although they are young and beautiful & energetic, they were insecure, awkward and lost in what they thought, how they should behave and what their next thought should be. The boys were trying to make an impression and the girls were battling their desire to let go, yet come across as “hard to get”. It was the most excruciating thing to watch because of the memories that flooded my mind of my own teenage years. I realized I would never want to go back to the days when I went through these awkward moments and confusing situations. I never want to go through the mistakes that I learned from, I paid dearly for who I am today and look forward to voyaging with time into my future no matter how much I resemble a raisin as I go along. Loved the piece about the suicide. Problem is that in our culture , anyone who decides to end their life is considered emotionally unstable and mentally incapable to make that decision. . “No one in their RIGHT mind, would want to consider ending it by will” . It might be liberating to think that you have that choice, but at the same time the moment you utter such thought, you are considered to be emotionally unstable due to a psychological condition and can actually imprison you involuntarily. .. We as “ licensed clinicians” have no choice but to get the authorities involved and go as far as involuntary hospitalization to prevent this from happening. It is so black and white that there is no debate about the reason a person might come to this decision. WE KNOW WHAT IS BETTER for them. Who are we? We are a bunch of “professionals” who are damaged in our own way and by our own experiences in life.. YET WE know Better.. I am an avid supporter of suicide when it comes to suffering the indignity that some conditions bring. J’aimerai tant les capturer à vie…. Youth is wasted on the young while the best drugs are wasted on the old. 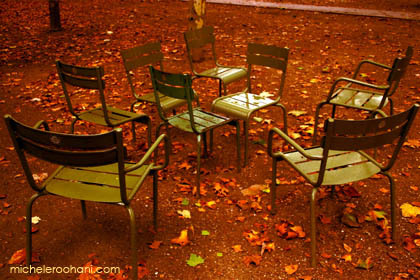 That photo of the chairs in the leaves is single most perfect representation of Autumn. I feel that wonderful sweater-y chill when I look at it.